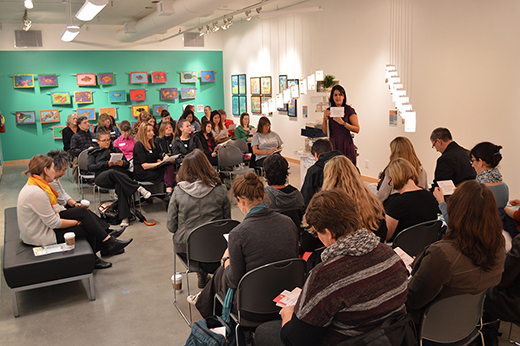 Friday, October 24, 2014 was a province-wide Pro-D day here in British Columbia, and ArtStarts in Schools was proud to present programming for educators at The Places You'll Build, an arts integration professional development event for elementary and secondary teachers held at the ArtStarts Gallery and Resource Centre in downtown Vancouver. The event tied into artwork on display at the brand new exhibition at the ArtStarts Gallery, Dwellings: From Seabeds to Cityscapes, which was just opened to the public that day. We were thrilled to have a full house, with educators joining us from across the province, from Vancouver to Kelowna to Port Hardy. 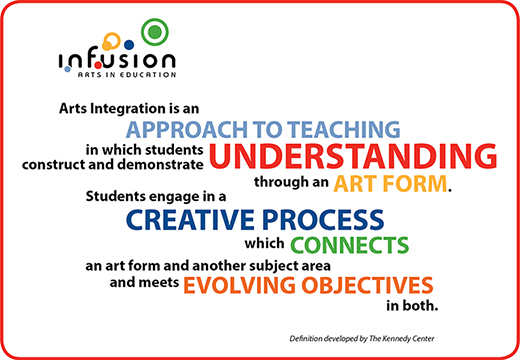 We opened the day with an exploration of our shared definition of arts integration. Using the definition crafted by The Kennedy Center, ArtStarts' Executive Director Navida Nuraney unpacked some of the concepts and ideas behind the key words that form the definition. 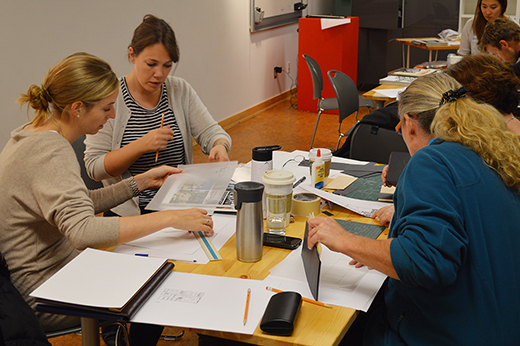 The group then split into two workshops, each joining a professional artist who could share their experience of working on an arts integration project in a classroom setting. 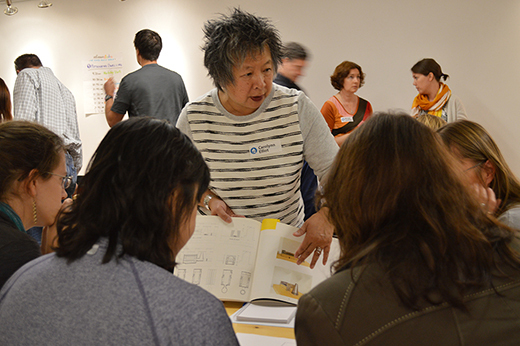 Artist Sandi Henrich led the "Sunlight and Shadows" workshop along with ArtStarts' Program Coordinator Elfred Matining. They started by heading out on a field trip to the nearby Vancouver Art Gallery, where they toured the exhibition, Emily Carr and Landon Mackenzie: Wood Chopper and the Monkey. Sandi talked to the group Emily Carr and Elfred also introduced some contemporary art. He challenged the educators to consider not only an art piece itself, but the many decisions that the artist must have made, including things we usually take for granted, such as how the size of the piece of paper we give to students can dictate the nature of a project, or whether the artist chose to place the canvas on a desk, on the wall, or on the floor. The 'unconscious' decisions we make during the creative process can all contribute to the artist's experience as well as their finished work of art. 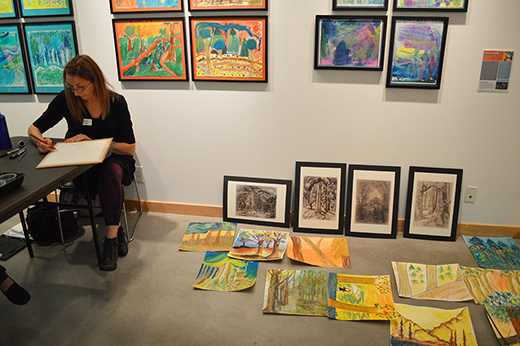 Educators also took part in an activity in which they watched how gallery visitors were interacting with the art pieces on display, and sketched their observations. Back at ArtStarts, artist Sandi Henrich spoke about her experiences working with elementary students in a classroom setting. Several paintings from her recent residency at Macaulay Elementary in Victoria are currently on display at the ArtStarts Gallery. Educators then had the chance to get messy. 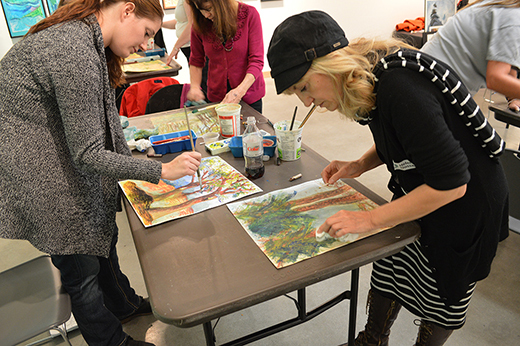 Sandi shared some techniques and tips that could employed to create various types of paintings. 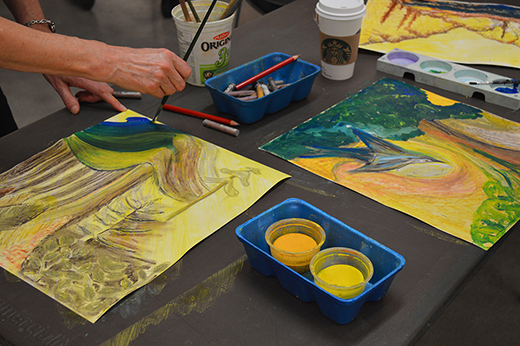 At the workshop, educators were invited to start developing their own visual language to express their ideas in art, using oil pastels, pencils, tempera paint and watercolours. Together, they bravely experimented with painting techniques and built their confidence to be able to facilitating similar activities in their own classrooms. 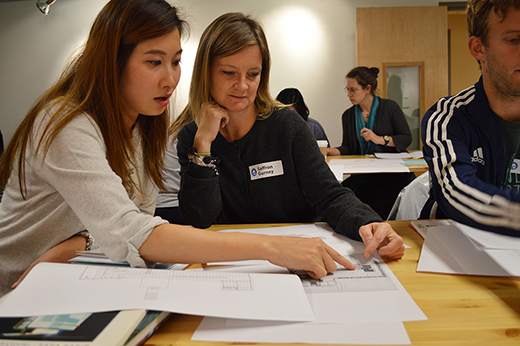 The other workshop, entitled "Rethinking Dwelling", was facilitated by high school educator Carolynn Elliot and architect Danielle Berwick. Together, they spoke about their collaboration to develop an arts integrated experience for Grade 11 and 12 students at Fleetwood Park Secondary in Surrey. Over the course of this project, students reflected and discussed the major challenges and changing expectations of modern day housing, and how this would affect them in the future. 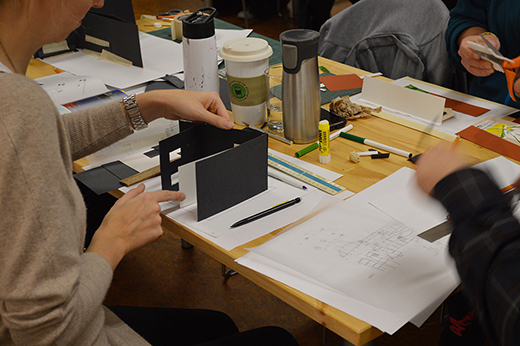 Students were challenged to invent spatial concepts of dwelling through model making. Each student built a model to scale responding to a question such as "How do I make a small living space feel spacious?" or "How do I combine the indoors with the outdoors?". The models were compiled into a village, creating new relationships between public and private as well as shared and individual spaces. 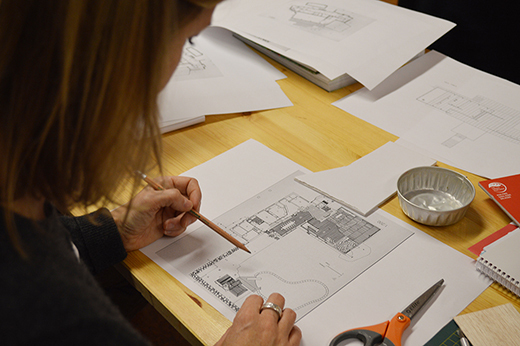 Pro-D participants got to experience a similar process for themselves, working on architectural designs and models. They experimented with and examined different perceptions of buildings and dwellings beyond the traditional idea of housing. 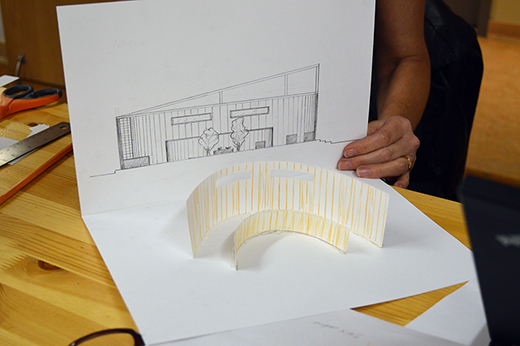 Working with a variety of materials, educators created architectural images and learned about the process of architectural design. Integrating Math and Architecture, they had the opportunity to explore the concept of using a scale, translating their ideas into 2-D and 3-D form. Throughout the day, educators were invited to consider how they may wish to approach such a process with students in their own classrooms and discover opportunities for cross-curricular connections. 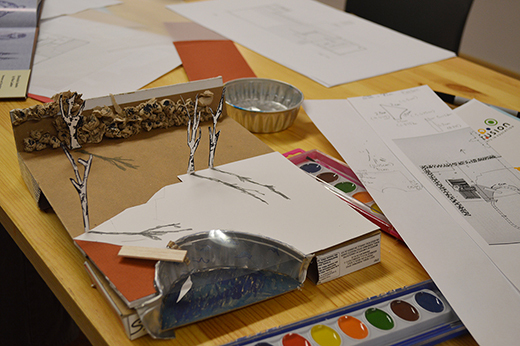 "Today's Pro-D helped cement my belief in art as a valuable process for students and teachers. More time needs to be dedicated to the pursuit of artistic thinking and being in this frenetic world of 'busy'!" 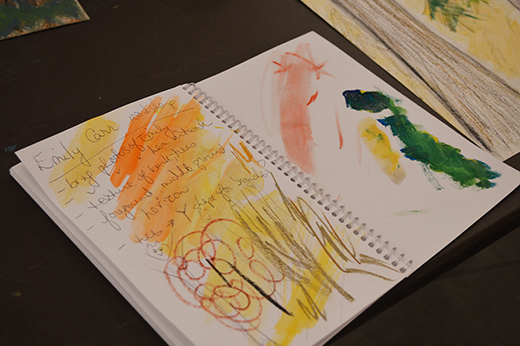 "I appreciate the reminder that art can be used as a tool to express learning. Paper and pencil need not dominate our classrooms." "With the BC Ministry of Education moving towards an Arts Education model, I welcomed the opportunity to explore a cross-curricular approach to incorporating arts with classroom subject areas." "Nothing compares to being in the seat of the student to empathize with their learning/art experience. Students need time to relax and be creative to do their best work." "I felt myself breathing out, relaxing, which created a canvas of openness to creativity. The space encourages this. You are walking the walk here! I am so grateful." Thanks to all the educators who joined us for this event! And special thanks to Sandi Henrich, Elfred Matining, Carolynn Elliot and Danielle Berwick for facilitating the workshops. We hope you also stay in touch by joining the free online community at artsinfusion.ca. 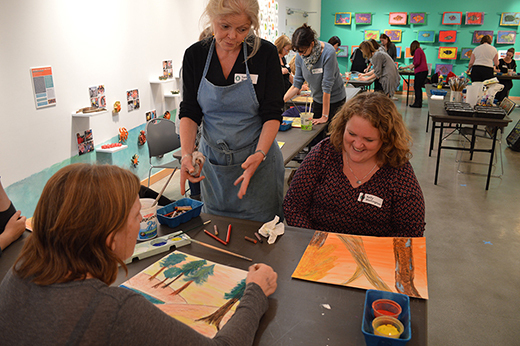 The Community of Practice brings together educators and artists in a forum that provides opportunities for collaboration and mentorship in arts integration. Join now to access resources, share ideas, connect with the community and find out about future events.